Hi, apologies if this has already been asked but a search didn't find any answers. I've taken a pair of hertz speakers out of my old car, woofers/tweeters with a crossover. I know the stock tweeters are mounted in the dash rather than the door card, does anyone know if these come out of a crossover or directly from the head unit? 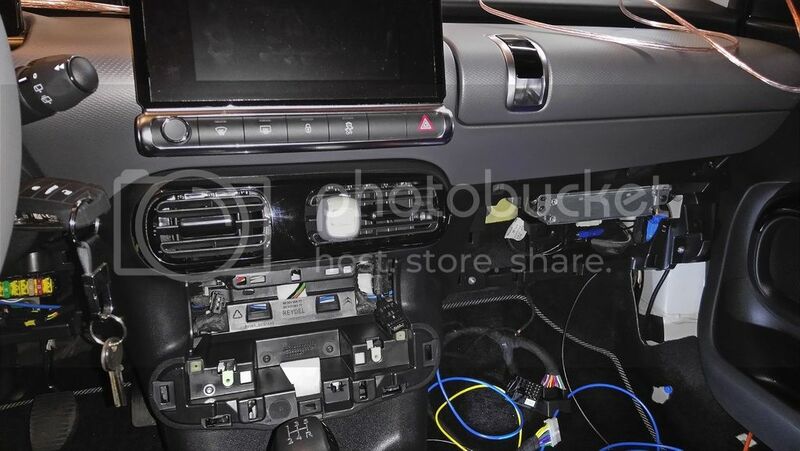 I'm hoping it's the latter as I'm reluctant to dismantle the dash if I don't need to, I'm hoping I can splice the crossover into the existing cables and simply replace the relevant speakers. If there is a crossover, where is it located? I've seen a YouTube video of someone replacing their cactus speakers, but he splices a filter onto the tweeter, but I'd rather use the crossover matched for my specific tweeter for fidelity. There is no crossover, just a small capacitor stuck on the tweeter. The wires run parallel to the door speakers and the tweeters in the dashboard. I've upgraded the music system im my Cactus, it's not that difficult, here's the link to my post on another forum. The text is in croatian, but take look at the links and pictures. Ok, if the cables run parallel where i can find them to split so i can install the crossovers? The SMEG unit is under the glovebox, well, on LHD car it's under the glovebox! Anyway, on the back of the unit is the quadlock connector and the wires for the speakers start there. Run new wires to the tweeters from the crossovers and leave the crossovers somewhere near the SMEG unit, there's plenty of space! You didn't mention which Hertz speakers you have, but their crossovers are pretty large and I think that is the only place you can fit them! and my I ask you another suggestion? if i want to add a small jbl underseat sub that i already have from previous car, where would you suggest to take 10amp? directly to the battery or somewhere else? I'm not sure where the wires for the front two channels form the HU branch off to the doors and the dashboard. If you use the original wiring, well, you void your warranty. And there will be some cutting and splicing so returning everything to stock will be harder. The biggest problem is that if you use the original wiring you need to fit the crossover exactly at the branching piont for the front woofers and tweeters. I have no idea where it is and it would include cutting into the cars wiring looms. Or use two pairs of crossovers. The problem then is that you dont have enough space behind the tweetrs to fit the crossovers. As for routing new wires.. If you want to use an amp, you need to find a high level input amp because the SMEG unit does not have low level outputs. And you need to splice into the original wiring. Use the front channels as inputs for the amp because the rear channels are heavily processed by the SMEG HU and they have no bass! For powering the amp, run the wire directly form the battery because if you take power from anywhere else the cars ECU can go crazy with all kinds of error warnings because of uncontrolled battery consumption. 1. Sound deadening the doors and removing the original foams and covers under the door cards (and replacing them with deadening material) because they are the main reason the sound in the Cactus is so bad. Just installing better speakers does not solve this. 2. New speakers - a good step but the SMEG unit is going to limit the power and the quality of the sound. Not worth it in my opinion if you do not plan to use an amp and DSP. 3. Amp + DSP - the only thing you need to be carefull with here is the fact that the SMEG unit does not have low level outputs. The DSP is needed because the original signal from the HU is heavily processed. So, first try just step 1, then 2+3! ...or just go crazy an do it all!